The Wellcome Apocalypse (MS. 49) is currently on loan to the Walters Art Museum in Baltimore, Maryland, and features in their latest exhibition, ‘A feast for the senses: art and experience in medieval Europe’. 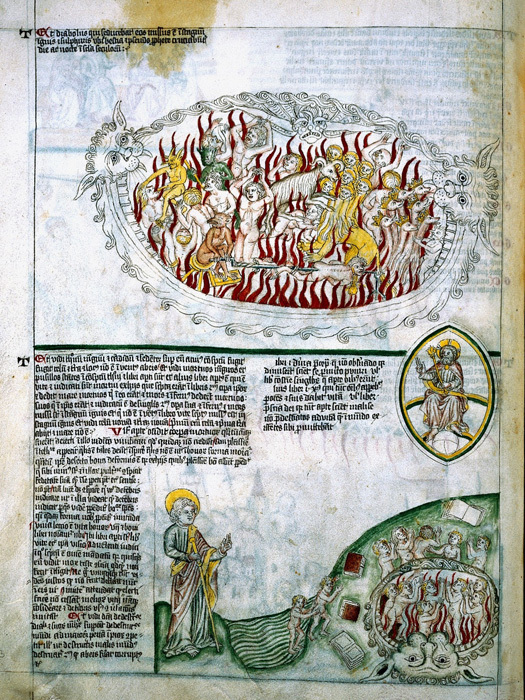 The Apocalypse is a beautiful, richly illustrated medieval manuscript and one of the treasures of the Wellcome Library’s rare, unique and distinctive collections. It was produced in southern Germany around 1420 and contains sections on the Antichrist and the End of Days, texts on and related to the ‘Ars moriendi’ (the ‘Art of dying well’), medical and prognostic works, and moral and allegorical material. 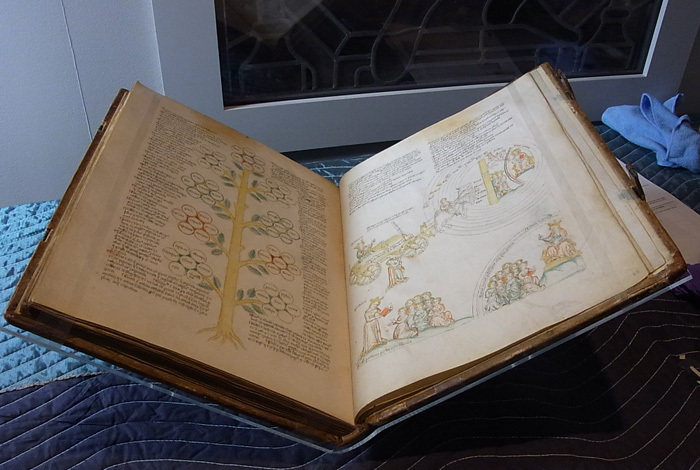 As a whole, the subject matter illustrates the close links between medicine and religion in the later Middle Ages. MS. 49, folio 25v: images within the Apocalypse of Saint John text. Wellcome Images L0019764. These days the word ‘Apocalypse’ is associated with catastrophic events signalling the end of the world. However it originates from the Greek word ‘apokalypsis’ which means ‘uncovering’ or the disclosure of something hidden. Hence the Book of Revelation (also termed the Apocalypse of Saint John), the last book of the New Testament in the Christian Bible. Although MS. 49’s modern-day name reflects the fact that it is an encyclopaedic work that provides revelatory information about spiritual and medical subjects, it is primarily termed ‘Apocalypse’ because it deals with the subjects of the Antichrist and the End of Days, and includes the Apocalypse of Saint John among its texts. 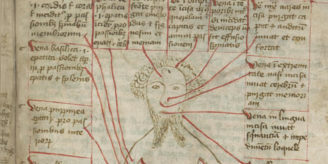 The manuscript appears in the exhibition’s section devoted to the role that sensation played in medieval cognitive theories, offering a magnificent illustration of the role of sensory perception in attaining spiritual enlightenment. The image in the opening displayed at the Walters Art Museum (folio 68 recto, the penultimate leaf), relates to the work of the 12th-century theologian Alain of Lille who in his poem the ‘Anticlaudianus’ (c. 1182) writes that Reason, guided by Prudence, can unaided discover most of the truths of the physical order; for the apprehension of religious truths, however, it must rely on Faith. On folio 68 recto, ‘The crowned Prudencia’ is shown, ‘carrying scales, riding a wagon. Concordia puts the finishing touches on the wagon. The wagon is seen riding through the heavens – concentric circles with the sun, moon and five planets – to the door of heaven. Once inside Prudencia rides alone, on one horse, towards the enthroned God. 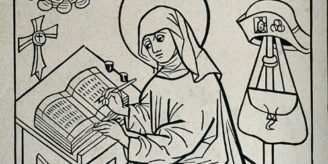 Prudencia, with a book, addresses eight young women seated upon the ground. Prudencia enthroned speaks to eleven young women seated upon the ground’. The image distils the entire meaning of Alain of Lille’s metaphorical poem into one vivid depiction. The Apocalypse was acquired by Sir Henry Wellcome for his Historical Medical Museum at a Sotheby’s auction in December 1931 from the sale of the library of John Thomas Adams of Sheffield. It had previously been acquired by the antiquarian booksellers Bernard Quaritch Limited in a major sale of the Sneyd family possessions in December 1903. Two other manuscripts of great interest, MS. 127 (a 15th-century miscellany of scientific works) and MS. 136 (an extensively illustrated 16th-century manuscript on prodigies), were acquired from Adams’s library at the same sale. Of MS. 49’s journey from Germany to England prior to 1903 sadly little is known. MS. 49 during installation at the Walters Art Museum exhibition. Image credit: Stefania Signorello. ‘A feast for the senses: art and experience in medieval Europe’ runs from 16 October 2016 to 8 January 2017. The Apocalypse will return home to Wellcome in January 2017 to preserve the pigments and vellum. 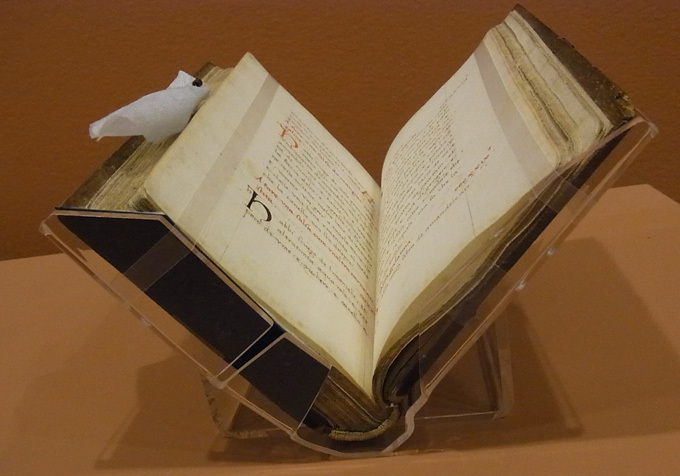 On the other hand, a second item that Wellcome has loaned to this exhibition, a medieval Italian cookery recipe book produced c. 1500 (MS. 211), will extend its stay in the USA as ‘A feast for the senses’ travels to its second venue, the John and Mable Ringling Museum of Art, Sarasota, Florida, from 4 February to 20 April 2017. It is displayed in the section in the exhibition on banqueting and feasting in late medieval courts, when power and authority were established in the fulfilment of the senses. The opening on display (folios 125v–126r), with its recipes for colouring sauces, shows the importance of the visual qualities of food, and how food played a role in spectacle. MS. 211 during installation at the Walters Art Museum exhibition. Image credit: Stefania Signorello. The two very different manuscripts currently on loan in the USA testify to the diversity, richness and intriguing qualities of medieval manuscripts. We encourage people to discover the Wellcome Library’s pre-1500 manuscripts, many of which have now been digitised.